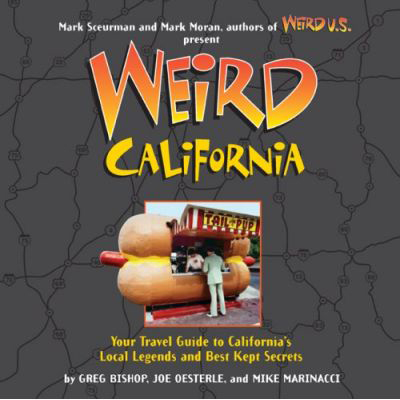 About 10 years ago I purchased a book called Weird California which gives you a brief description of all the kooky places to visit in California from Bubblegum Alley to the Mystery Spot. 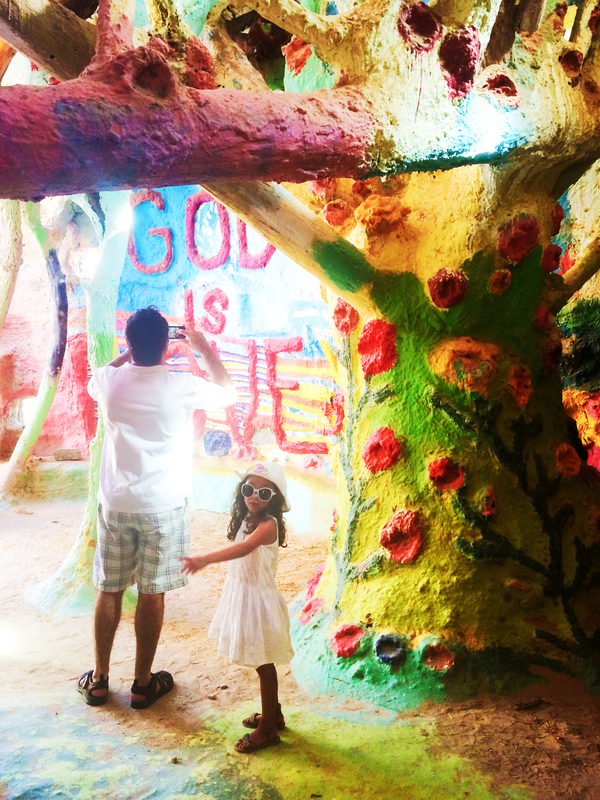 Most of them made me chuckle but it wasn’t until I saw Salvation Mountain that I thought wow this place is magical. So where is this mystical location? 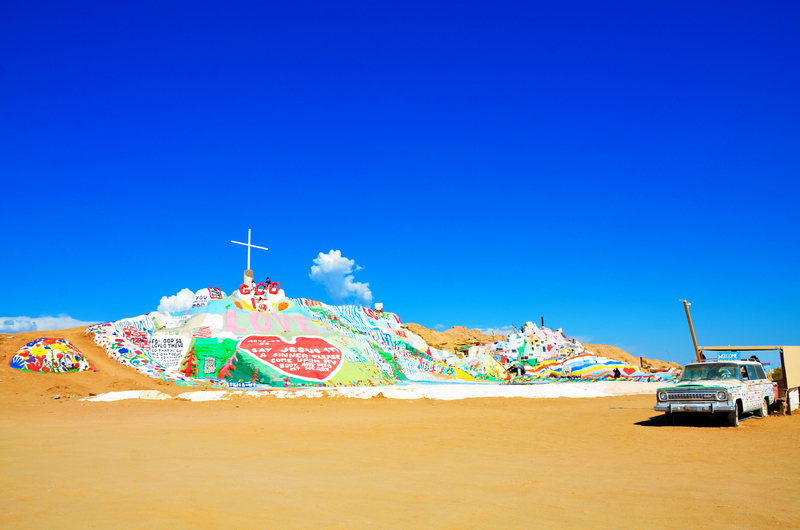 Niland. 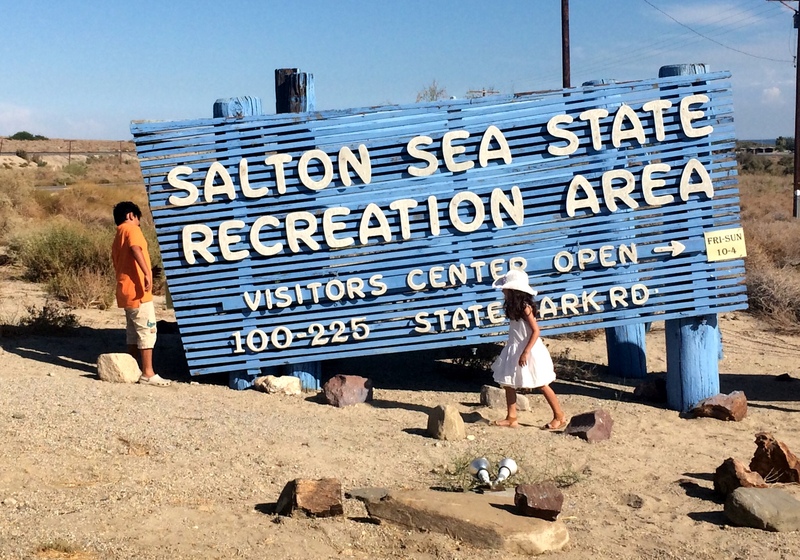 Before you hit google, Niland is east of Palm Springs, pass Indio then head onto Highway 111 towards the Salton Sea. 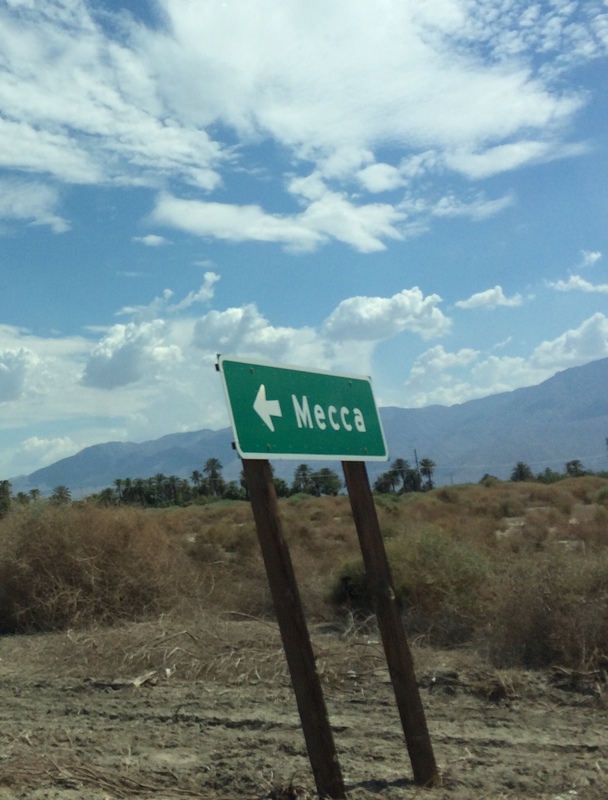 From there you pass Mecca (not the holy land but sill I’m counting this as my visit) and go on for about 30 minutes more and tah da you’re in Niland. 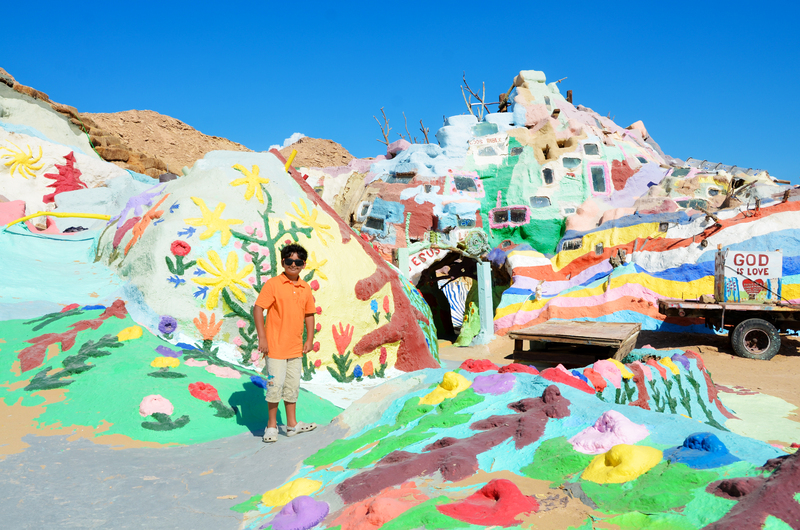 At first glance, Niland is a sleepy little agricultural town once known as a major grower of tomatoes. 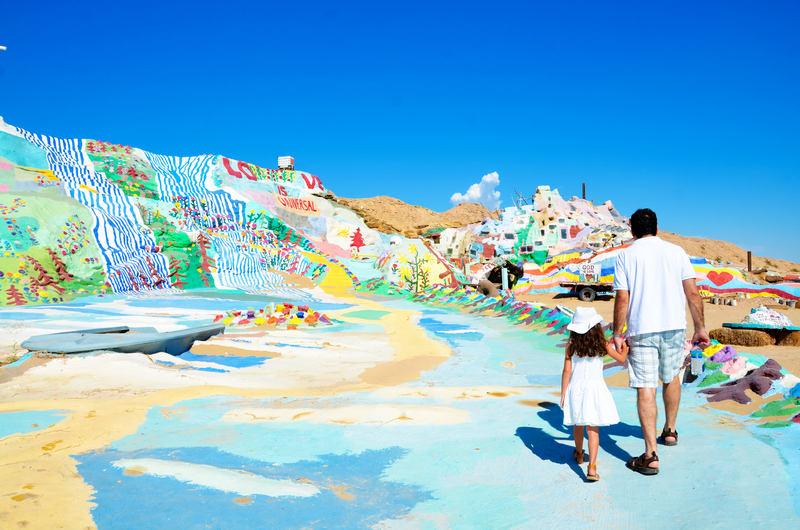 With a population of roughly 1,000 people, this tiny town is made up of 562 homes and a few markets so if you are planning to make a day of it make sure to fill up your tank with gas, bring a picnic lunch and gallons of water. As you drive through the main strip in town, you feel like you’ve somehow made a wrong turn. Don’t be discouraged you actually have to drive through town and then a few miles out-of-town pass the Sanitary District and then out in the middle of nowhere you see something in the distance. With temperatures rising to 112+ degrees and the wind blowing sand along your windshield, you see it. 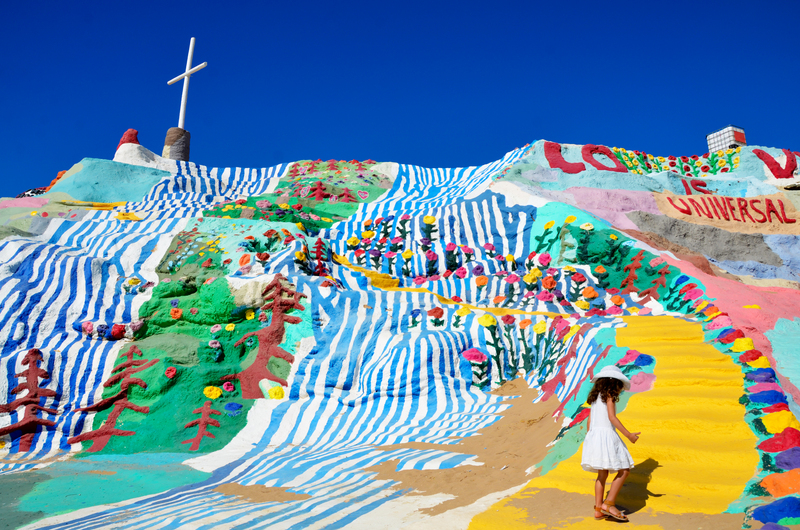 A huge multicolored mosaic of scripture, flowers, trees and the American flag all sculpted into the side of a mountain with adobe and straw. For a moment you don’t believe what you are seeing before you. How can this possibility be here? Here in the middle of nowhere – and by nowhere I mean NOWHERE! Why did Leonard Knight, the man who made this work of art, come here? How did he do this? His answer God. 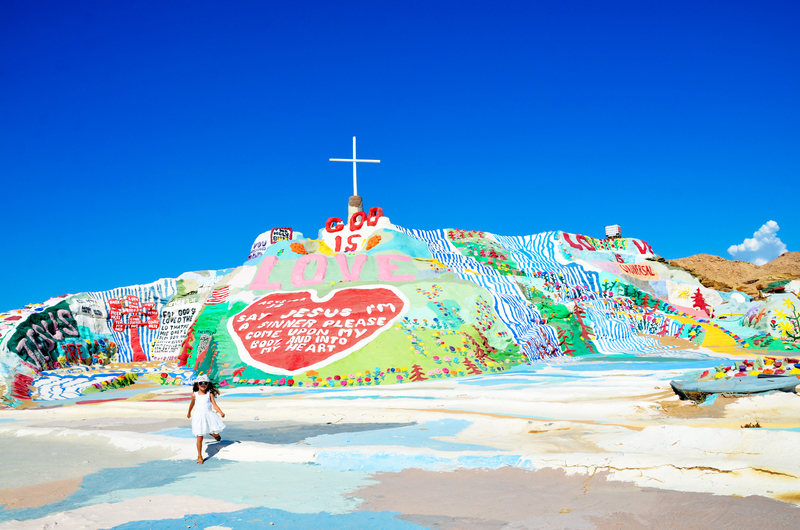 He spent 30 years building Salvation Mountain to share with the thousands of visitors each year the message that God is love. His message is pure; universal, all-inclusive of all denominations in that it did not specify a particular dogmatic system. 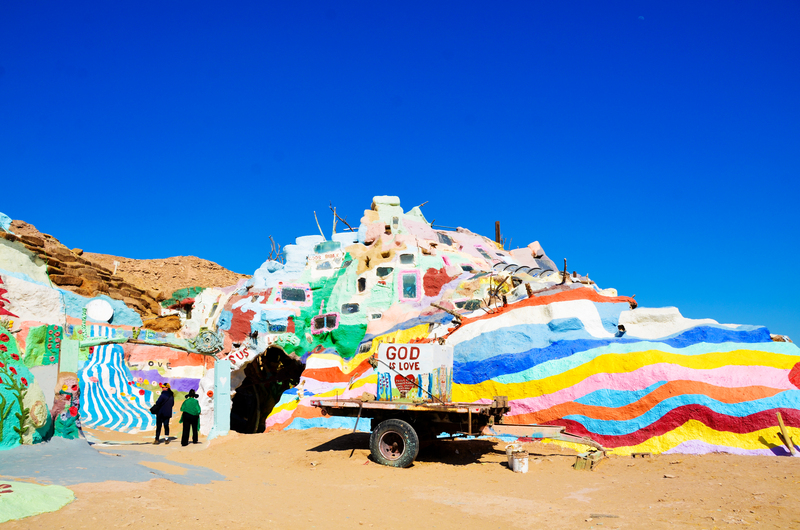 Unfortunately Leonard passed away February 10, 2014 and concerns have been raised for the future of the site, which requires constant maintenance due to the harsh surrounding environment. 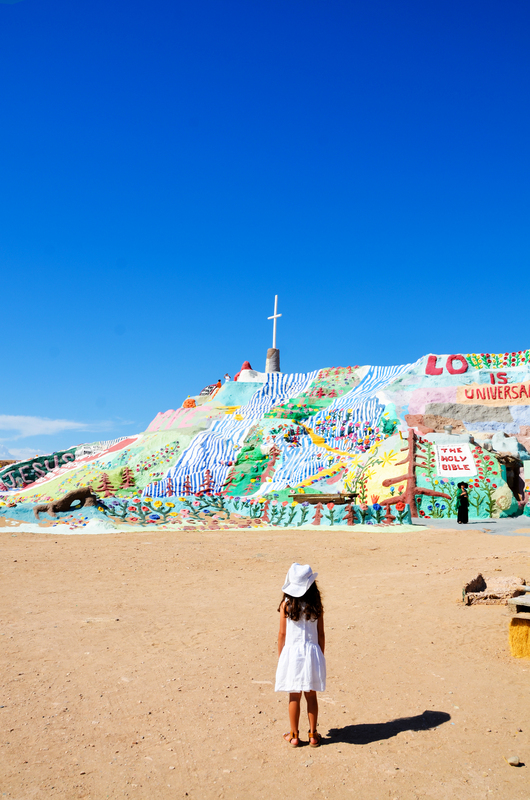 People come from all over the world to see Salvation Mountain as an art site not a religious message. 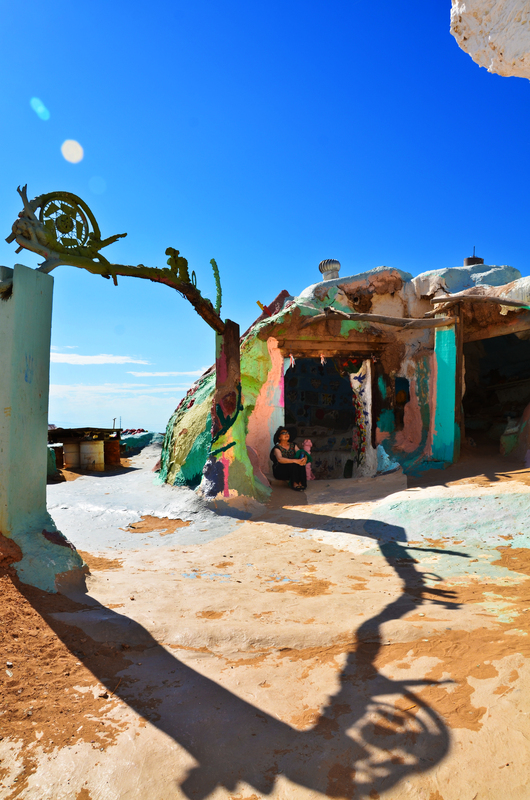 Many visitors bring paint to donate to the project and a group of volunteers have been working to protect and maintain the site from not only nature but also vandals. 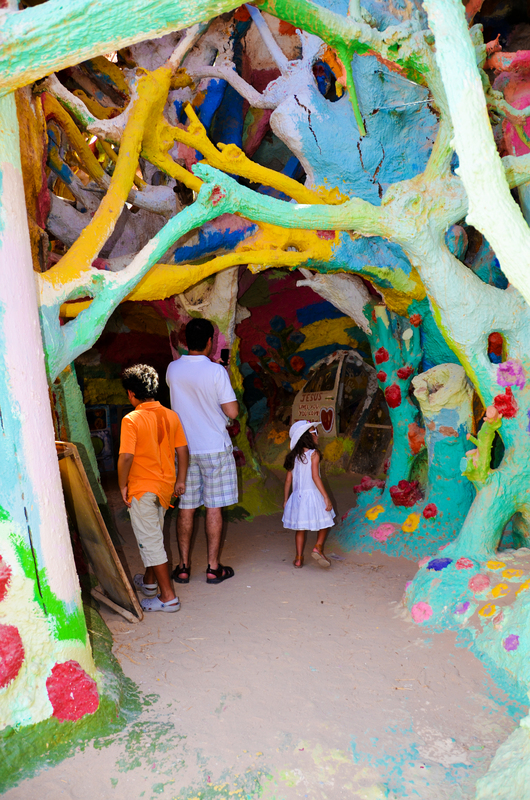 If you would like to visit Salvation Mountain then do so in the winter or spring. If you do decide to go during the summer dress lightly and make sure to take lots of water with you to keep hydrated as well as your camera. 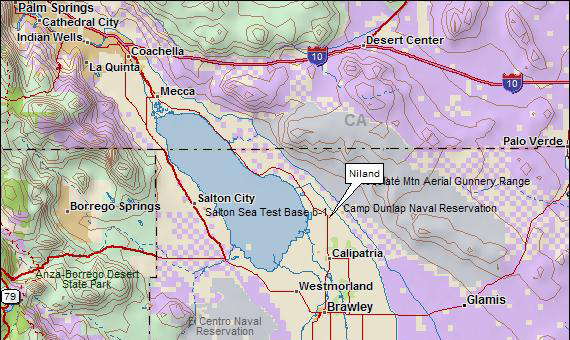 The closest to an address that I could find is Beal Rd Niland, CA 92257. I hope you do visit this beautiful work of art and are as moved as I was.